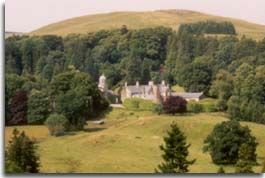 Craigengillan, is set amidst the hills of the Southern Uplands of Scotland, some 16 miles east of Ayr by Dalmellington. Craigengillan was first established as an estate in 1580, when it encompassed over 30,000 acres, stretching as far as Carsphairn. The founding family, the McAdams, and their descendants, remained the proprietors until 1999. The present day look of Craigengillan, is from work carried out in the 1780's. This time saw the earliest parts of the present mansion built, and the layout of the landscape such as woodlands, granite stone dykes and the first of the stone bridges across the River Doon. Today, the estate consists of 3000 acres of woodland, pasture, and water providing a diverse habitat. The farm, with full organic status, carries a flock of 1200 black faced ewes. The estates website www.craigengillan.com gives more images and information on its riding school, other outdoor activities and accommodation. The Scottish Dark Skies Observatory was opened on the estate in about 2012.